The 1st Squadron, 9th Cavalry troopers earned three Medals of Honor in Vietnam. For conspicuous gallantry and intrepidity in action at the risk of his life above and beyond the call of duty. 1LT Poxon, Armor, Troop B, distinguished himself while serving as a platoon leader on a reconnaissance mission. Landing by helicopter in an area suspected of being occupied by the enemy, the platoon came under intense fire from enemy soldiers in concealed positions and fortifications around the landing zone. A soldier fell, hit by the first burst of fire. 1LT Poxon dashed to his aid, drawing the majority of the enemy fire as he crossed 20 meters of open ground. 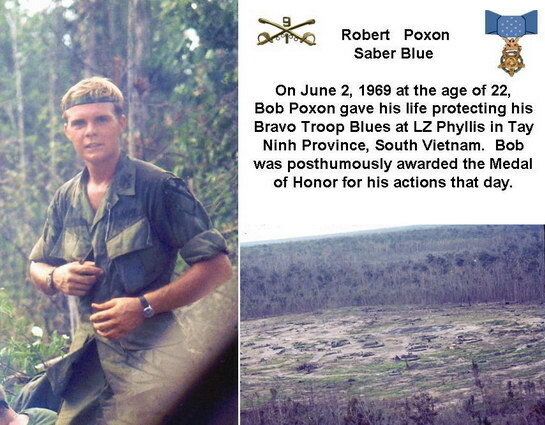 The fallen soldier was beyond help and 1LT Poxon was seriously and painfully wounded. 1LT Poxon, with indomitable courage, refused medical aid and evacuation and turned his attention to seizing the initiative from the enemy. With sure instinct he marked a central enemy bunker as the key to success. Quickly instructing his men to concentrate their fire on the bunker, and in spite of his wound, 1LT Poxon crawled toward the bunker, readied a hand grenade and charged. He was hit again but continued his assault. After succeeding in silencing the enemy guns in the bunker he was struck once again by enemy fire and fell, mortally wounded. 1LT Poxon’s comrades followed their leader, pressed the attack and drove the enemy from their positions. 1LT Poxon’s gallantry, indomitable will, and courage are in keeping with the highest traditions of the military service and reflect great credit upon himself, his unit, and the U.S. Army. Rank and organization: Sergeant, U.S. Army, Troop D, 1st Squadron, 9th Cavalry, 1st Cavalry Division. Place and date: Near Song Be, Republic of Vietnam, 14 September 1969. Entered service at: Bangor, Maine. Born: 13 October 1948, Caribou, Maine. For conspicuous gallantry and intrepidity in action at the risk of his life above and beyond the call of duty. Sgt. Skidgel distinguished himself while serving as a reconnaissance section leader in Troop D. On a road near Song Be in Binh Long Province, Sgt. Skidgel and his section with other elements of his troop were acting as a convoy security and screening force when contact occurred with an estimated enemy battalion concealed in tall grass and in bunkers bordering the road. Sgt.Skidgel maneuvered off the road and began placing effective machinegun fire on the enemy automatic weapons and rocket-propelled grenade positions. After silencing at least 1 position, he ran with his machinegun across 60 meters of bullet-swept ground to another location from which he continued to rake the enemy positions. Running low on ammunition, he returned to his vehicle over the same terrain. Moments later he was alerted that the command element was receiving intense automatic weapons, rocket-propelled grenade and mortar fire. Although he knew the road was saturated with enemy fire, Sgt. Skidgel calmly mounted his vehicle and with his driver advanced toward the command group in an effort to draw the enemy fire onto himself. Despite the hostile fire concentrated on him, he succeeded in silencing several enemy positions with his machinegun. Moments later Sgt. Skidgel was knocked down onto the rear fender by the explosion of an enemy rocket-propelled grenade. Ignoring his extremely painful wounds, he staggered back to his feet and placed effective fire on several other enemy positions until he was mortally wounded by hostile small arms fire. His selfless actions enabled the command group to withdraw to a better position without casualties and inspired the rest of his fellow soldiers to gain fire superiority and defeat the enemy. Sgt. 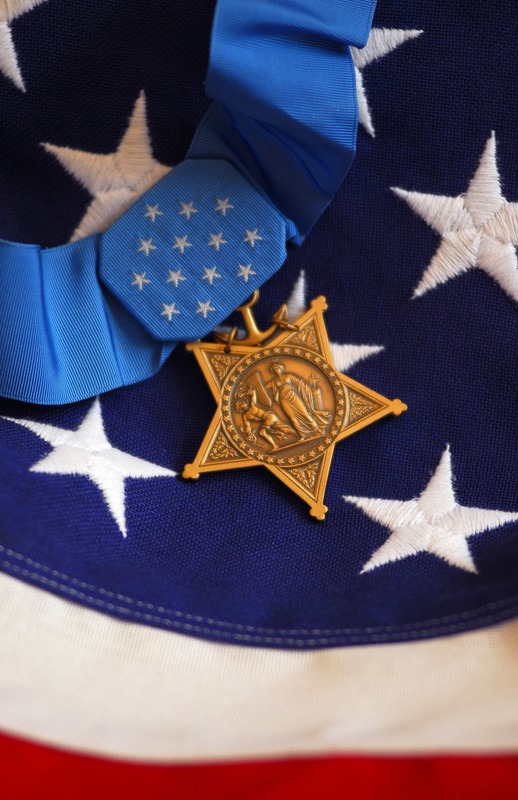 Skidgel’s gallantry at the cost of his life were in keeping with the highest traditions of the military service and reflect great credit upon himself, his unit, and the U.S. Army. On Friday, May 3, Mark “Babysan” HILTON (C Trp Lift pilot, ’70-71) piloted his UT-1 Camry to PZ Falls Church to load up Bill MOELLER (C Trp, avionics, ’70-71, Rockville, MD ), Jesse JAMES (C Trp, HHT engine mechanic, ’69-70, Prince George, VA ) and myself, for transport to LZ Ft. Myer for the memorial service for SWANSON and HARRISON. The chapel service was punctuated by Jon’s daughter Brigid’s courageous statement that ended with a “Welcome Home” to us all. I lost it then. Like I said, we have a great new family addition with whom we should establish and sustain contact. The service was followed by a procession to the interment site led by military band and color guard and the horse-drawn caisson carrying the flag-draped casket. They were fittingly buried together with full military honors. Quite something to witness. There were lots of Cav Hats there, but I cannot possibly know who they all were. Some folks represented Jon’s first tour Unit. 1-9th guys I knew included Bob TREDWAY (C Trp CO ’69-70, 409 N. Street SW, Washington, DC 20024-3701, ) and John POWELL (C Trp Scout and Cobra pilot, ’69-71, Stafford, VA ). Mike “Loadhacker” SLONIKER (VHPA historian and former CAV pilot) led a few of us to pay homage at the gravesite of our hero, Ron TIMBERLAKE). Also there was my bud, former President of the Vietnam Helicopter Crewmembers’ Assn. , Chris WHITE , who drove down from Baltimore. Former VHPA president and SWANSON’s flight school classmate, Tom PAYNE (, was there and has produced a great website tribute to Jon at . And Joe GALLOWAY, co-author of “We Were Soldiers Once … And Young” was also there with his own Cav Hat! I was also very proud to see that the present day 9th Cavalry continues to recognize their legacy. Attending all events last week were the following 1-9th soldiers from Ft. Hood: Btn CO, LTC Roger MCDONALD, CSM Walter SMITH, B Co CO, CPT Jack CRABTREE, and B Co 1SG Everett CLARK. LTC MCDONALD led the incredible welcome we received at the 9th Cav luncheon during last year’s First Cav. Div. Assn. reunion in Killeen/Ft. Hood. 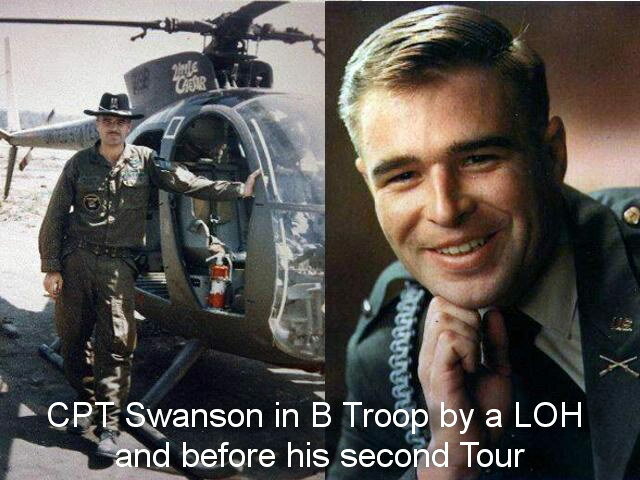 CPT SWANSON became the third 1-9th Cav Trooper to be awarded the MOH. 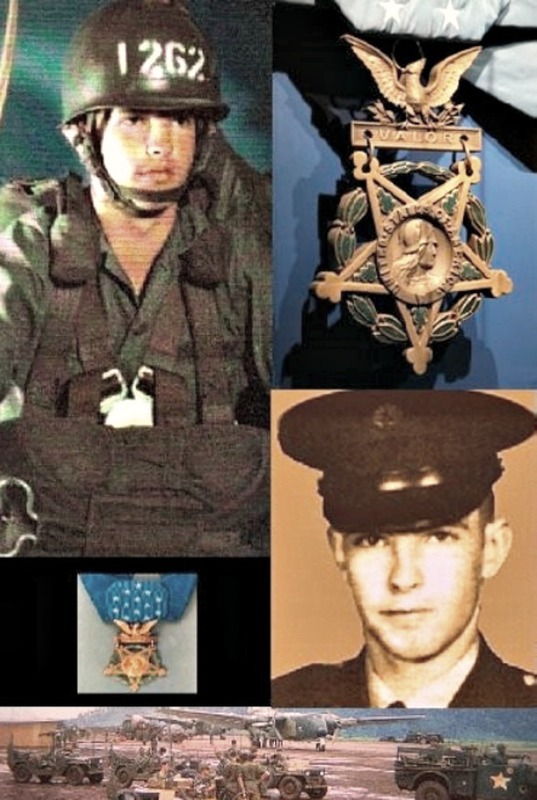 The other two are SGT Donald S. SKIDGEL, Trp D, 14 Sept ’69, and 1LT Robert L. POXON, Trp B, 2 June 1969. Each died as a result of their heroism. Good job, Rob. Very interesting. I am not sure if this will help my son.and I am asking if you could tell me where I could get some help for my son . His father is Sgt.Donald Sidney Skidgel..our son Terry Skidgel was only 1 when his father died in Vietnam. All these years have been very hard on our son he has not been able to let go of not knowing his dad.Our son was hurt and he can’t do the building and construction he used to.he is a dad with 2 sons. He had put in for disability.he has custody of his boys because their mother is not fit .His sister is working to get help from the state of Maine but they are making it hard.The reason I am writing this is because our son is living in a trail or that is falling apart he can’t use is arm for long he has started to build a house.but now he can’t .because he has no income. terry is a very proud man like his Dad .Do you know where he could turn to get some help.he only needs supplies . His sister is helping him .if you have and ideas .could you call my daughter Tammy Skidgel.We would help him but we don’t have the extra money we do a lot but he needs just a home he is ashamed.on how he is living. if anyone has any ideas please call my daughter at 207-938-7000.thank you.